Vladimir Putin in Turkey. Russian-Turkish talks. Putin.BLOG Foreign Policy Turkey Vladimir Putin in Turkey. Russian-Turkish talks. 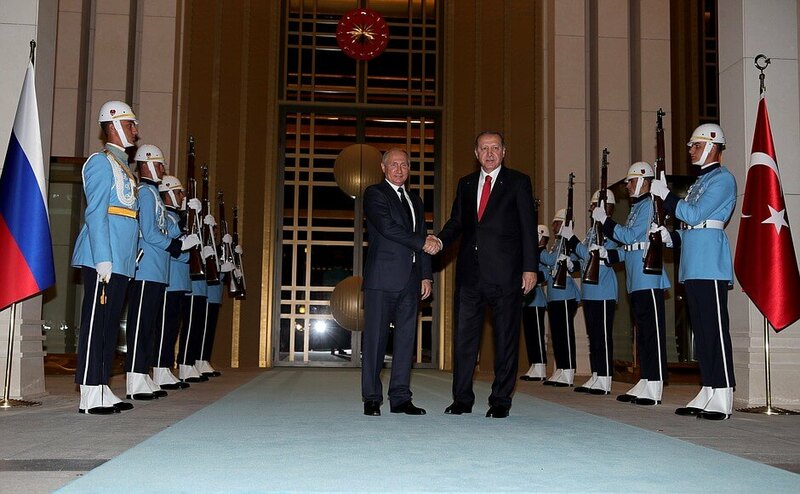 Vladimir Putin held talks with President of the Republic of Turkey Recep Tayyip Erdogan in Ankara. President of Turkey Recep Tayyip Erdogan greeting Russian President Vladimir Putin. President of Russia Vladimir Putin and President of Turkey Recep Tayyip Erdogan had a one-on-one conversation, after which Russian-Turkish talks continued in an expanded format. Press statements following Russian-Turkish talks. I would like to extend a warm welcome to all of you here. 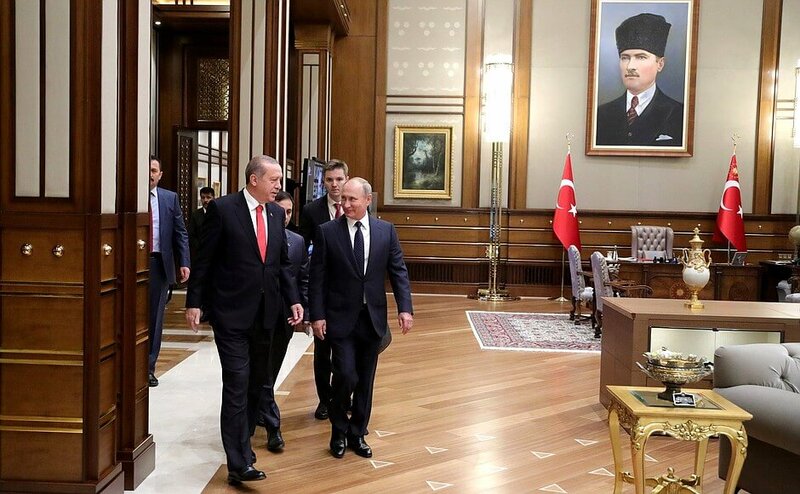 Vladimir Putin with President of Turkey Recep Tayyip Erdogan. First of all, it is a pleasure to again welcome my friend, Mr. Putin, to my country, Turkey. During our meetings we discussed bilateral relations and regional developments, and our respective agencies have held a meeting as well. It is for the fifth time that my dear friend and I have met this year. We often telephone each other to discuss issues on our agenda. Of course, such Russian-Turkish meetings were not held so often before, but we have now reached the level required for holding them. In addition, our ministers maintain close contacts with their Russian colleagues. Thanks to our concerted efforts, our relations have grown stronger and our cooperation continues to expand. God willing, we will provide a new impetus to them soon. 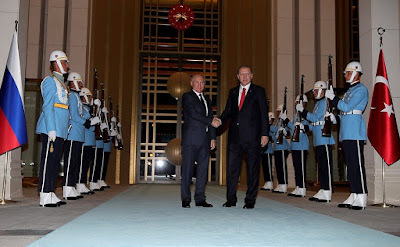 Vladimir Putin during his visit to Ankara with President of Turkey Recep Tayyip Erdogan. We have come to an agreement on preparing the political, economic, cultural and social issues for discussion at the seventh meeting of the High-Level Russian-Turkish Cooperation Council. Both Turkey and Russia attach great significance to these meetings. Next year, Vladimir Putin will come to Turkey again in order to attend the next meeting of this council. Our trade increased in the first seven months of this year, and the number of Russian tourists has soared compared to last year. Talks between Russia and Turkey in Ankara. We have also agreed that there are ways to further enhance our economic indicators. As you know, we have set the goal of increasing our trade to $100 billion. We hope to achieve good results regarding the critically important issues of our bilateral economic relations during a meeting of the Mixed Intergovernmental Russian-Turkish Commission. Energy is a major part of our relations. 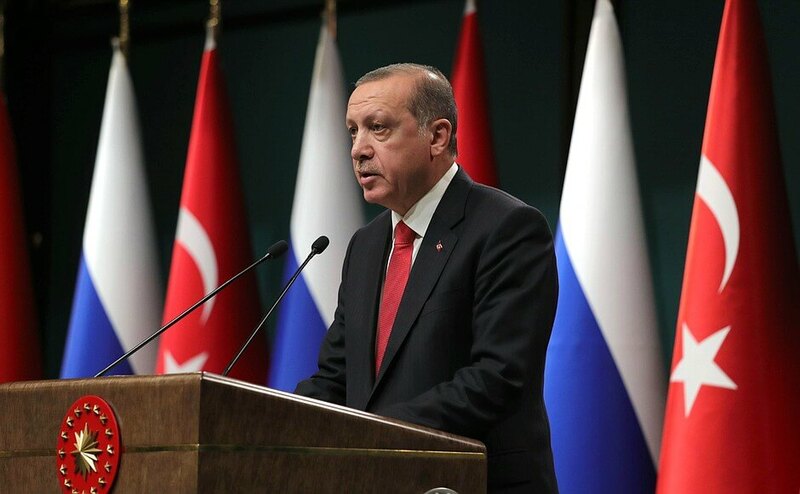 We continue to implement the Turkish Stream and the Akkuyu Nuclear Power Plant projects. We attach great importance to their early implementation. We discussed these projects during our meeting. We believe that our concerned agencies will accelerate their implementation. President of the Republic of Turkey Recep Tayyip Erdogan. Today, we also discussed the situation in Iraq and Syria. We attach great importance to Iraq’s territorial integrity, sovereignty and political unity. Unfortunately, our region has become more fragile recently. It is unfortunate that the Kurdish Regional Administration in Iraq held a referendum, bringing about a regional crisis that nobody wanted. This referendum is illegal under the Iraqi Constitution and international law. Nevertheless, and despite a friendly warning, the regional administration proceeded with the referendum. This was a big mistake. No one has the right to increase tension and create an explosive situation for personal short-term gain. I told President Putin that we must prevent steps that could result in even greater mistakes by the regional government. 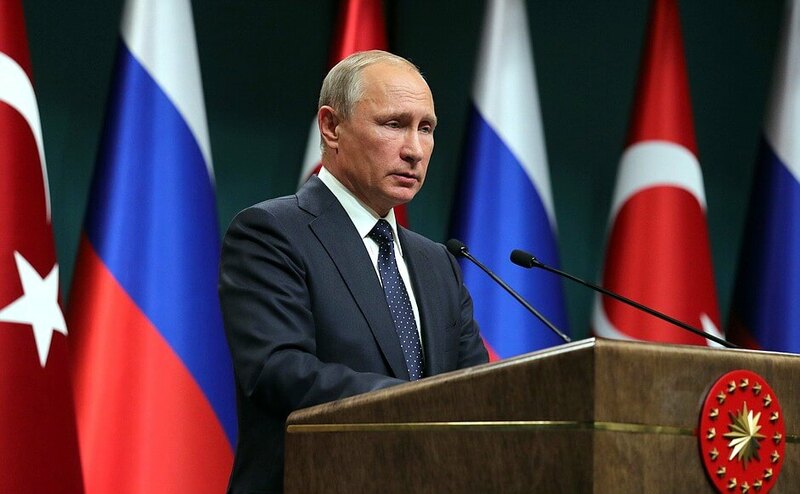 Russian-Turkish talks in expanded format. Turkish delegation. During today’s meeting with my friend President Putin, we discussed the ongoing developments in Syria, as well as the outcomes of the last Astana meeting. In this respect, we talked about the efforts to make Idlib de-escalation zone operational. I am confident that the relevant bodies will work proactively on this matter. We are satisfied with the Astana consultations to strengthen the ceasefire as a contribution to the ongoing political process in Geneva under the auspices of the UN. We also agreed on the need to give even greater priority to confidence building measures as part of the Astana talks. We reaffirmed our firm commitment to engage in close cooperation to achieve a political settlement of the Syrian conflict. I believe that today’s meetings with my friend Vladimir Putin were fruitful. We will continue to work together through telephone conversations and personal contacts. I now pass the floor to Mr. Putin. First of all, I would like to thank our friend, the President of Turkey, for his invitation. Ladies and gentlemen, we have just completed another round of talks or, to be more exact, another meeting. President of Russia Vladimir Putin. Press statements following Russian-Turkish talks. This was by all means a working meeting, offering us an opportunity to have a detailed and frank exchange of views on matters on the bilateral agenda in various areas, as well as discuss further joint actions related to the settlement of the crisis in Syria. If you don’t mind, I would like to begin with this topic. We confirmed our readiness to abide by the final agreements reached in mid-September in Astana at the sixth International Meeting on Syria on the establishment of four de-escalation zones, including the largest one in Idlib province. 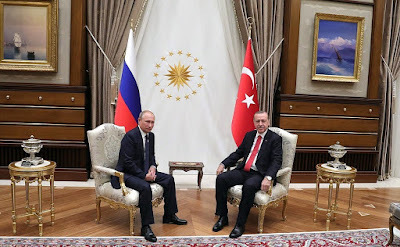 Let me remind you that the initiative to set up de-escalation zones in Syria was put forward during our meeting with Recep Erdogan in May 2017 in Sochi. Russian-Turkish talks in expanded format. Russian delegation. 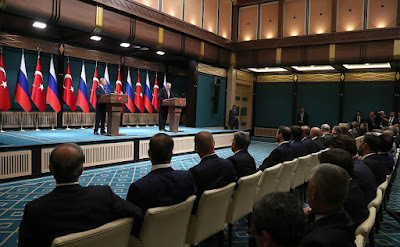 It has to be acknowledged that the implementation of this idea was quite challenging for the parties to the Syrian conflict, as well as for the guarantor countries in the Astana process: Russia, Turkey and Iran. However, despite all the challenges, we have achieved positive results. I believe that these agreements are a major joint success for us, as well as for Mr. Erdogan, since he was among those who initiated this process. In fact, the necessary conditions were put in place for ending the fratricidal war in Syria, the final elimination of terrorists and enabling Syrians to return to peaceful life and their homes. This is essential not only for the Syrian people, not only for the region, but for the whole world: we are putting in place conditions so that refugees can return home. This has critical importance in terms of achieving long-term political settlement in Geneva under the UN auspices. 0 Comment to "Vladimir Putin in Turkey. Russian-Turkish talks."